Missouri voters have three marijuana proposals to choose from on Nov. 6. 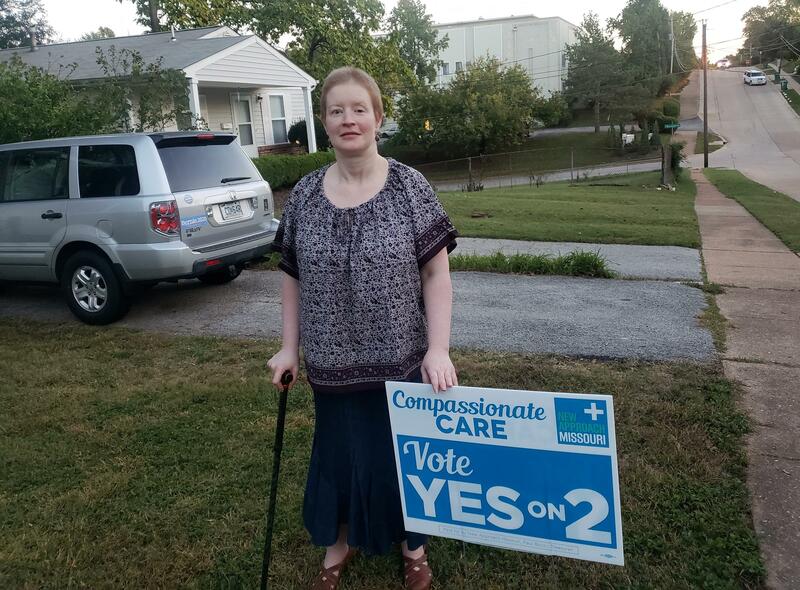 Marie DeBor of Webster Groves is front and center in the longstanding debate in Missouri over medical marijuana. DeBor, who has multiple sclerosis, is hoping that the drug changes her life. DeBor has a sign in her yard in favor of Amendment 2, a proposed constitutional amendment that has raised the most money and has the most endorsements among the three pot proposals on Tuesday’s ballot. Missouri voters will face three different ballot initiatives Tuesday that seek to legalize marijuana for medical use. St. Louis Public Radio's Jo Mannies takes a look at all three, and talks to supporters and opponents. DeBor, who just turned 40, says she fits that bill. She’s been battling fibromyalgia for 20 years and has had multiple sclerosis for almost as long. She has had numerous medical procedures and possibly faces more. DeBor hopes for a fuller life, for herself and her family, including her 4-year-old daughter. “I’m hoping that with the use of medical marijuana, I’ll be able to be more active in my life and have more of a quality of life with my daughter, with my partner, so that I’m not sitting at home whenever they go out to do things that I can’t join in on,” she said. Marie DeBor, of Webster Groves, has multiple sclerosis and hopes marijuana can help address her symptoms. So far, there is no organized opposition to the overall effort to legalize marijuana in Missouri for medicinal use. But Brandon Costerison with the National Council on Alcoholism and Drug Abuse in St. Louis sees lots of problems. He fears that there’s been too much of a rush in Missouri and other states to embrace marijuana without adequate study. Costerison would like to see testing to verify or dispute the benefits. He also isn’t keen on the taxes that advocates would tack on to marijuana products. Amendment 2 would impose a 4 percent tax on marijuana sales. The Missouri Department of Health and Senior Services would be in charge of implementing the program. That would include the licensing of medical-marijuana cultivation facilities and dispensaries. The money raised by Amendment 2 would go to the state to pay for regulating the program. Any money left over would go to the Missouri Veterans Commission. Key supporters and opponent of the dueling pot proposals on the Nov. 6 ballot: (L-R) Mike Colona, Brad Bradshaw, Jack Cardetti and Brandon Costerison. All participated in a recent forum hosted by St. Louis Public Radio. The Missouri VFW is among the supporters, in part because veterans with PTSD and other illnesses could potentially benefit. Amendment 2 would allow patients to cultivate up to six plants of their own marijuana, with a physician’s authorization. The plants must be “in a confined space, under lock and key,’’ Cardetti said. The plants also must be available for state inspection. As Amendment 2’s backers see it, their main opposition is Amendment 3 – a proposal that has generated lots of controversy. Amendment 3 is primarily the work of one person, Brad Bradshaw, a physician and lawyer in Springfield. He has put up most of the money to get his plan on the ballot. Amendment 3 calls for a 15 percent tax. Half of the money raised would pay for a new medical research center that he says would be devoted to curing cancer. Bradshaw would be initially in charge of setting up a board to oversee the center and the medicinal-marijuana program. Bradshaw says his center would be more aggressive against cancer than well-known medical facilities in St. Louis and Kansas City. Bradshaw emphasizes a key difference – Amendment 3 will not allow “home grow’’ by patients. They would have to go through sanctioned dispensaries. Cardetti with Amendment 2 accuses Bradshaw of trying to set himself as the “marijuana czar,” and notes that Amendment 3 would have no government oversight. He also points to Amendment 3’s provision that would give it the power of eminent domain to obtain property. Bradshaw says the lack of government control would be a good thing. He also downplays the impact of Amendment 3’s proposed eminent-domain powers. Bradshaw went to court to unsuccessfully get Amendment 2 and the third pot proposal – Proposition C – knocked off the ballot. He challenged his rivals’ signature-collection operations. Former state Supreme Court Judge Mike Wolff helped defend Amendment 2 in court, and got the case tossed out. Wolff contends that Bradshaw’s real aim had been to get rid of his opposition, in order to give voters only one choice in November. Wolff says that the amendment that receives the most votes next Tuesday will be the one that goes into effect. But others aren’t so sure. Missouri Secretary of State Jay Ashcroft, who oversees elections, has said he expects legal fights if more than one marijuana initiative passes. The third pot proposal is Proposition C, which would change state law but would not alter Missouri’s constitution. There’s a legal gray area about the proposition’s provisions, should it pass – along with Amendment 2 or 3. Proposition C calls for a 2 percent tax on the sale of marijuana. The money raised would be split among veteran services, drug treatment and early childhood education. Mike Colona, a former legislator who is among the leaders of the Proposition C campaign, has pressed for legislative action for years to legalize medical marijuana. Although he wasn’t successful, Colona said he still believes the General Assembly has a role to play – one of the reasons why he and his allies sought to get a proposition on the ballot, instead of a constitutional amendment. He said a proposition offers more flexibility. It will be more difficult to revise the constitutional amendments, he said. Meanwhile, Dr. Mimi Vo of St. Louis is watching the debate closely. She has had patients who claim to have been helped by marijuana. Vo backs Amendment 2. She says she’s done enough research to be convinced that medicinal use of marijuana needs to be legal, with some government oversight. Vo said she’s concerned that because marijuana now is illegal some people are possibly obtaining tainted marijuana and putting their health – or lives – at risk. She said government regulation is a better option. Pro & Con: Will Missourians pass an initiative to legalize medical marijuana? 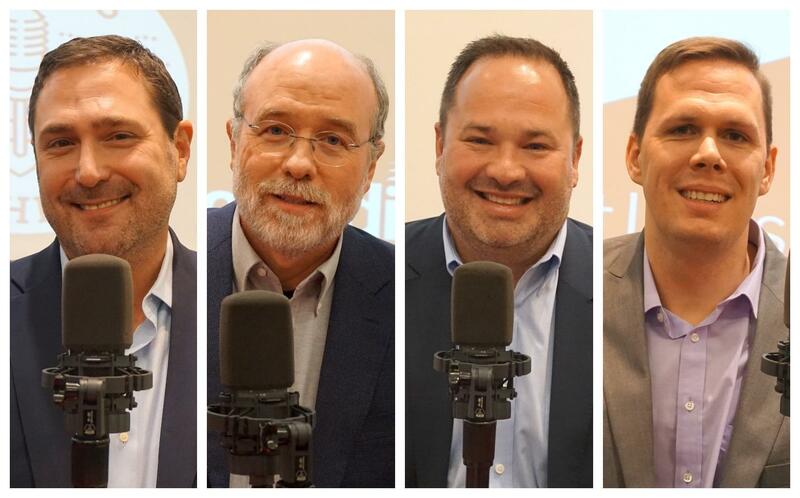 As part of St. Louis Public Radio's "Inform Your Vote" ballot issues forum, Jack Cardetti, Brad Bradshaw, Mike Colona, and Brandon Costerison debated the pros and cons of Amendment 2, Amendment 3 and Proposition C, the three competing ballot measures to legalize medical marijuana. The conversation aired Tuesday on St. Louis on the Air, with Cardetti speaking in favor of Amendment 2, Bradshaw in favor of Amendment 3, Colona in favor of Prop C and Costerison of NCADA in opposition to all three measures. St. Louis Public Radio’s Jason Rosenbaum and Jo Mannies delve into the three medical marijuana initiatives. Missourians will vote on Amendment 2, Amendment 3 and Proposition C. All three initiatives would make it legal to get marijuana for medical use. But they differ greatly in terms of how much marijuana will be taxed, how the regulatory framework would work, and where the money would go. Missouri state law says that if there are two conflicting constitutional amendments, the measure with the “largest affirmative vote” will prevail.